A while back I heard about this cool website called Gimme Draw!--a blog run by an animator who just loves to draw. You can send him pictures and he'll draw a caricature--for free! Seriously, no strings attached. Very cool. So I sent the picture of Steve and me that's on my Blogger profile. And this morning I discovered he had finally drawn us--how exciting! For now, it's at the top of the Gimme Draw! page, but the direct link to the specific post is here. I only wish he would have done it in computer animation like the rest of the caricatures...it seems all of a sudden he's switching things up. I would have loved to see the other version. The question is...do you think it even looks like us? I need to get a hold of a Charles Spurgeon book. I'm not sure I've ever read a quote of his that didn't penetrate my heart. Like this one. Who among us doesn't need to hear it? You are meddling with Christ's business, and neglecting your own when you fret about your lot and circumstances. You have been trying "providing" work and forgetting that it is yours to obey. Be wise and attend to the obeying, and let Christ manage the providing. Excuse the blogging hiatus as of late. Good reason: I spent Saturday-Tuesday up in Indiana! To make a long story short, some last-minute plans came up, changed, and changed again--the result of which being some time in Indy and then a fabulous opportunity for me to reconnect with old friends in Marion. 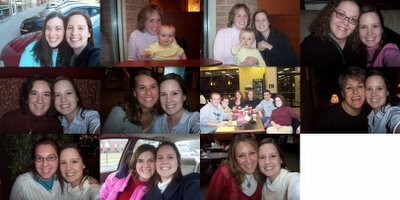 The picture, beginning at top left: (1) Dottie, my co-editor on the newspaper staff at IWU; (2) Kelly, a dear college friend and accountability partner, and her precious 10-month-old daughter Emily; (3) Kelly, Emily and me at Panera Bread; (4) Aeron, a girl I mentored at IWU; (5) Jaala, another girl I mentored at IWU; (6) Stephanie, my roommate and fellow ministry team member for two years; (7) a group of chorale friends at Tree of Life for "caffeine night"; (8) Lyn, the awesome woman of God who mentored me in college (and sang at our wedding); (9) Sara, a girl I mentored at IWU; (10) Jamie, a chorale friend and writing major friend whom I went to Mongolia with; and (11) Sara, Lyn's daughter who's now an IWU student. (The blank space goes out, with regrets, to Sandra and Kevin, whom Steve and I stayed with in Indy on Saturday night but forgot to get a picture with, as well as Maria, who conveniently left town Saturday morning and drove to Wisconsin as I drove to Indiana.) These dear people, plus several others whom I don't have pictures of, welcomed me, drove to see me, bought me coffee or meals, opened their homes to me, and shared their hearts with me. I saw the beauty of Christ in them, and it was wonderful. I also got to sit in on a chorale rehearsal, which was fantastic. Strange to be one of those "former chorale members who come back and visit," whom Prof introduces and asks to say a few words about what chorale meant to them, etc. I didn't expect to almost cry as I urged the current members to make the most of every moment and "never offer God a sacrifice that costs you nothing," as Prof/the Bible says. I exhorted them to resist the temptation to "check out" and go on autopilot, instead giving 100 percent in worship to the God who deserves all our praise. Anyway, as I told them, chorale was without question the highlight of my college career--and I loved hearing them sing again. Prof even invited me to join them in singing the benediction at the end of rehearsal--ah, what a gift. I don't deserve such blessings--but am unspeakably grateful for them. (And for my sweet husband, who not only agreed but actively pushed and encouraged me to take the trip, though it meant extra gas money and a couple of days away from him.) To say "God has been good to me" seems a gross understatement--but He has. Seems like every time I turn around--there it is again. More and more I find that anytime I'm dealing with sin or conflict, anytime I'm struggling with anxiety or out of whack emotions, if I dig deep enough, pride is at the root in one form or another. Guess I'm not alone (though that's small comfort): pride formed the core of the first sin. Nasty thing, that pride. Ugly thing. Though I'm dismayed and horrified when the pride in my heart rears its ugly head again, I'm thankful that God is gracious enough to expose it so it can be rooted out. So I repent. I ask Him to cleanse my heart. Remove the pride. Cut it out. Burn it out. Erase it from my heart. Teach me to walk in humility. New sin (or same old one) pops up. Cycle begins again, like the directions on shampoo: Rinse and repeat. Discouragement. Defeat. "When will I ever be rid of pride? I hate it! I so desperately want to walk humbly before God." Hopelessness. "I pray also that the eyes of your heart may be enlightened in order that you may know...his incomparably great power for us who believe. That power is like the working of his mighty strength, which he exerted in Christ when he raised him from the dead and seated him at his right hand in the heavenly realms, far above all rule and authority, power and dominion, and every title that can be given, not only in the present age but also in the one to come" (Ephesians 1:18,19-21, all emphases added). Wait, what was that? The power that God used to raise Christ from the dead is the same power that's at work in me! So when, in discouragement and defeat, I say to myself, "I'll never be rid of this ugly pride," what am I saying? Do I really believe that God's power is strong enough to raise the dead and produce salvation for fallen humans...but impotent when it comes to overcoming my sin and making me like Jesus? What's stopping me from believing, like Abraham, that God keeps His promises? "Yet he did not waver through unbelief regarding the promise of God, but was strengthened in his faith and gave glory to God, being fully persuaded that God had power to do what he had promised" (Romans 4:20-21). "For sin shall not be your master, because you are not under law, but under grace. ...You have been set free from sin and have become slaves to righteousness" (Romans 6:14,18). Do I think that my inability to overcome pride in my own strength--my complete lack of willpower or faithfulness to walk consistently in humility simply by obeying rules--means there's no hope I'll ever conquer the ugly sin in my heart? "...through Christ Jesus the law of the Spirit of life set me free from the law of sin and death. For what the law was powerless to do...God did by sending his own Son in the likeness of sinful man to be a sin offering. ...And if the Spirit of him who raised Jesus from the dead is living in you, he who raised Christ from the dead will also give life to your mortal bodies through his Spirit, who lives in you" (Romans 8:2-3,11). But how? If all this is true, why am I still struggling with pride? "But he said to me, "My grace is sufficient for you, for my power is made perfect in weakness." Therefore I will boast all the more gladly about my weaknesses, so that Christ's power may rest on me" (2 Corinthians 12:9). "To this end I labor, struggling with all his energy, which so powerfully works in me" (Colossians 1:29, emphasis mine). The paradox: I'm weak/He's strong. I labor/with His energy. I struggle/He works in me. "I pray that out of his glorious riches he may strengthen you with power through his Spirit in your inner being, so that Christ may dwell in your hearts through faith. And I pray that you, being rooted and established in love, may have power, together with all the saints, to grasp how wide and long and high and deep is the love of Christ, and to know this love that surpasses knowledge—that you may be filled to the measure of all the fullness of God. Now to him who is able to do immeasurably more than all we ask or imagine, according to his POWER that is at work within us, to him be glory in the church and in Christ Jesus throughout all generations, for ever and ever! Amen" (Ephesians 3:16-21, emphasis mine). "You are awesome, O God, in your sanctuary; the God of Israel gives power and strength to his people. Praise be to God! (Psalm 68:35). ...event churches in general - the one's I've been to - don't do a good job of taking "seekers" deeper and farther in their understanding of Christianity after they've prayed the sinner's prayer. These churches instead offer simple surface teaching in "big church", Sunday school, midweek bible study, small groups and in the requisite on campus book store. This is especially odd since these churches often attract professionals with degrees, sometimes even advanced degrees. it's as if we pastors think folks can design a building or perform surgery but are too stupid to understand scripture. ...So we have churches full of believers taught like seekers. ...And I was an evangelist for the event church model for years, fought with "old" guys with words like "relevant" and "cutting edge" and now I feel very wrong for having done so, and I see more and more the downsides to drinking that Kool-Aid, the damage it's done to me and others. I'm thinking a lot about the things we/I care about most and the things Jesus seems to have cared about most. I wonder if He would spend $250,000 on a big screen, $100,000 on a catwalk and intelligent lighting...or would he build a housing project for low income families or spend more on mission work, start cottage industries in unused church space, buy sonogram machines for crisis pregnancy centers, train the unemployed, pay people's bills, start a free medical clinic, provide free counseling for members, give scholarships, fund the underground churches of the world, train foreign pastors in theology etc etc. He asks some great questions. You can read the rest here. 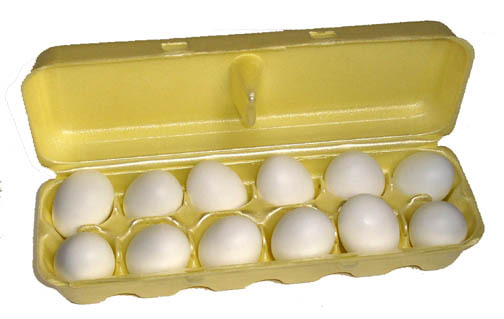 Did you ever notice how people in churches seem to be like eggs in a carton? People come and sit in nice neat rows, not touching each other in the styrofoam environment of Christian individualism and "right to spiritual privacy." The eggs might be Methodist eggs or Presbyterian or Baptist eggs or those generic eggs in the independent, non-denominational churches. It is important to know the label on the carton. No one likes "a bad egg. "And one thing you must do when buying eggs in a carton is open it and make sure no egg is broken. "I have not stopped...remembering you in my prayers. I keep asking that the God of our Lord Jesus Christ, the glorious Father, may give you the Spirit of wisdom and revelation, so that you may know him better" (Ephesians 1:16-17). How often do I pray for a person or a situation for about a week, and then get bored and discouraged because I don't see any answers? Paul says he will keep asking God to give the Ephesians increased knowledge of Himself. Ever since Paul heard about the saints at Ephesus (v. 15), he had not stopped remembering them in his prayers. What makes me stop praying? Do I believe that my sense of urgency or timing is wiser than God's? Do I think that I want this good, God-glorifying thing more than He does? Do I secretly doubt (though I'd never say it this way) that He's able to accomplish what I ask? Maybe there were days when Paul grew a little weary of praying for the same thing. If the Ephesians were anything like you and me (and I'd guess in some ways they were), they struggled with the same sins over and over. They sometimes had wrong ideas about God, or got their priorities out of whack, or failed to love. But Paul kept on remembering them in his prayers. He kept asking God to give them His Spirit, to give them wisdom and revelation. I think what kept Paul at it was the memory of the words that the Holy Spirit had already inspired him to write to Thessalonica: "The one who calls you is faithful and he will do it" (1 Thessalonians 5:24). Paul placed all his hope in that truth. He knew he was powerless to bring about what he prayed for. He knew his best efforts alone couldn't produce this kind of growth in the Ephesians. But with all his heart, he trusted that God could--and would. Lord, give me the grace to persevere in prayer. When I become weary or start to doubt, increase my faith and strengthen my trust in You. I believe that you are faithful and that you will do it! "Having believed, you were marked in him with a seal, the promised Holy Spirit, who is a deposit guaranteeing our inheritance until the redemption of those who are God's possession--to the praise of his glory" (Ephesians 1:13-14). When we make a deposit toward something, we generally do so to guarantee that we will receive that something in full later. I make a security deposit so that I can live in an apartment. I make a down payment so I can drive a new car. I make a bank deposit so I can start an account and withdraw funds. I make a vacation deposit to reserve my place in the hotel and on the plane. So when I read this passage from Ephesians, I'm struck by the contrast: God makes a deposit to guarantee our inheritance. Let me say that again: God makes the deposit of the Holy Spirit, and we gain eternal life with Him. He pays the price; we reap the blessings. Another reminder that salvation is a precious gift, given freely. God knew I couldn't pay even the deposit required, let alone the full cost. Contrary to popular belief, the exorbitant cost couldn't be satisfied by "my good deeds outweighing my bad" (which they wouldn't--even my good deeds are too often laced with pride). I couldn't earn a penny toward the payment; all my filthy attempts at righteousness wouldn't have added up to two cents. So while I was still helpless and hopeless in sin, He paid the ultimate price. And when I trusted Him, He went even further, setting His seal of ownership in me as a deposit. It's His deposit, not anything I do to try to earn approval or acceptance, that guarantees my place with Him. *Scott Klusendorf was the speaker at the northwest Ohio CPC’s spring banquet back in April. Fantastic pro-life apologist: his logic and reasoning are rock-solid, so he easily holds his own with abortion advocates completely apart from Scripture (which, though of course important, is not convincing to the world at large). His Life Training Institute blog, which provides news and commentary on pro-life issues, is clear and compelling—and the other bloggers who write here are thought-provoking and insightful as well. *Don't be misled by the title of Carolyn McCulley's Solo Femininity: I’m not single, but I am daily encouraged and challenged by the things she writes. I come away from her posts admiring this woman of God, but more importantly, seeing Him more clearly. Her pursuit of the Lord as a single woman and her passion to serve Him are inspiring. *I only discovered Gospel Driven Life a couple of weeks ago, but it has already become a must-read. Mark Lauterbach looks for the Gospel in all things and constantly reminds us to keep the main thing the main thing. I know I need to be pointed back to the centrality of the Cross again and again—this blog helps me get there. *The subtitle of Between Two Worlds is an apt description: I get a whole lot of my news on “theology, philosophy, politics and culture” from Justin Taylor. He provides great links and occasional commentary that both keep me up to date on what’s happening in the world, and help me look to the world beyond. *Carolyn Mahaney and her married daughters, Kristin, Nicole and Janelle, team up to exhort women to love Christ more and grow in grace over at Girl Talk. But this one isn’t just for women, either. Though there’s often “girly” content, these godly ladies post challenges about holy living and reminders about the Gospel that men can benefit from as well. *Bob Kauflin started his blog not long ago as a resource for worship leaders—it’s so much more. From theology to devotional thoughts to practical advice about corporate worship through music, Worship Matters has fantastic content for everyone. And this guy practices what he preaches: I was at a conference where he led worship a few years ago, and I believe it was one of the most Christ-centered experiences of worshiping passionately in spirit and in TRUTH that I’ve ever had. He’s talented, and more than that, he’s dedicated to glorifying God through real, Cross-focused worship, as his blog illustrates time and again. *I "ran into" Tony Myles when he commented on my blog a few months ago. No idea how he found me, but I’m glad he did, because his blog is now a frequent stop for me. The first post I read was the one that explains his quirky title, Don’t Call Me Veronica (there's a link to the explanation post at the top of the blog), and his sense of humor hooked me. Glad I’ve kept reading—besides being funny, Tony is consistently excellent at getting me to see the church and the world from a different and refreshing perspective. "And he made known to us the mystery of his will according to his good pleasure...to bring all things in heaven and on earth together under one head, even Christ" (Ephesians 1:9-10, emphasis mine). Christians often say we serve "the God of second chances." I know many times I've expressed my personal thankfulness for that fact. But I don't think we fully grasp the magnitude of that statement. As I'm reading an awesome new book, Randy Alcorn's Heaven, I'm becoming more and more astounded by God's power and glory. It's not only that God doesn't give up on me. It's not only that He gives depraved sinners chance after chance (though that alone would be incredible!). He will give all of creation a second chance--God has no plan B for the world because He doesn't need one! Heaven will be a revolutionary book for most people--especially if you've never read any of Alcorn's other books to gain insight on his understanding of heaven. And it's inspiring. Contrary to (unfortunate) popular belief, God has no plans for disembodied spirits floating around on clouds and playing harps, eternally sinless but eternally bored. Far from it! Lately I've been especially gripped by Alcorn's explanation that redemption isn't just for mankind--rather, the redemption of all of creation is essential to God's plan. "God's redemptive goals are far less modest than we imagine. He surrenders no territory to the enemy," he says. He refers to Isaiah 65:17, Isaiah 66:22, 2 Peter 3:13 and Revelation 21:1, which all speak of God's promise of a New Earth--a fully restored and renewed version of our fallen, cursed planet. "What lies behind our notion that God is going to destroy the earth and be done with it?" Alcorn asks. "I believe it's a weak theology of God. Though we'd never say it this way, we see him as a thwarted inventor whose creation failed. Having realized his mistake, he'll end up trashing most of what he made. His consolation for a failed Earth is that he rescues a few of us from the fire. But this idea is emphatically refuted by Scripture. God has a magnificent plan, and he will not surrender Earth to the trash heap." God has never given up on his original creation. Yet somehow we've managed to overlook an entire biblical vocabulary that makes this point clear. Reconcile. Redeem. Restore. Recover. Return. Renew. Regenerate. Resurrect. ...These words emphasize that God always sees us in light of what he intended us to be, and he always seeks to restore us to that design. Likewise, he sees the earth in terms of what he intended it to be, and he seeks to restore it to its original design. God placed mankind on Earth to fill it, rule it, and develop it to God's glory. But that plan has never been fulfilled. Should we therefore conclude that God's plan was ill-conceived, thwarted, or abandoned? No. These conclusions do not fit the character of an all-knowing, all-wise, sovereign God. God determined from the beginning that he will redeem mankind and restore the earth. Why? So his original plan will be fulfilled. God hasn't changed his mind; he hasn't fallen back to Plan B or abandoned what he originally intended for us at the creation of the world. ...God doesn't throw away his handiwork and start from scratch--instead, he uses the same canvas to repair and make more beautiful the painting marred by the vandal. The vandal doesn't get the satisfaction of destroying his rival's masterpiece. On the contrary, God makes an even greater masterpiece out of what his enemy sought to destroy. Well, I could sit here all day and type quotes from the book to you. But besides the problem of getting tired, not to mention violating copyright laws, you'd miss out on the richness of Alcorn's studies of Heaven. You better just go get the book for yourself! You won't regret it. I am so grateful for and in awe of the fact that God does not give up on His creation. He won't destroy and abandon His people or His world--He has already set the plan in motion to redeem all things, to restore and resurrect all that He once called "very good." As hymn writer Isaac Watts put it, "He comes to make his blessings flow / Far as the curse is found!" *All quotations (c) 2004 Tyndale House. So many people go to church to get some useful truth to apply to their lives. When we probe, we find out they are sincerely seeking to be a better person. Sounds admirable. Three months into the Gospel of John I have concluded that it is not admirable. ...We do not need instruction in a better philosophy of life. We do not need commands to obey or a set of principles for self-improvement. If that is what we needed, then salvation may be within our reach. It is not. Here’s how legalism can progress in my life using stewardship of time as an illustration: If I become a better time manager, I think God approves of me. I tend to approach the throne of grace with confidence. However, when I fritter away my time or give in to laziness, I can feel God disapproves. He’s not happy with me. And I often want to avoid approaching God’s throne until I get my act together. It happens subtly and can even go undetected in my life for awhile. But relating to God in this way is an egregious error. I hope you'll take a minute to read the full post here. This summary post of old posts goes out to my college roommate Stephanie, whose favorite book is Philippians :) Just a collection of a few posts I wrote last spring as I was reading through Philippians. I ran across them as I was reading old posts for my "year in review" and decided to post them again as a compilation--I pray one or two of them might be an encouragement to one or two of you who weren't reading my blog back then. So I'm a little late with the year-in-review post. What can I say. I do like to spend New Year's Day reviewing the past year of my life, reflecting on what I've learned and where I've been. Buzzing through my blog archives made that a different experience this year. I thought I'd take some time here to recap 2005. It has been a year of overwhelming changes, with exuberant, joyful times sandwiched between dark and discouraging times. But God has been faithful--the same good and gracious God yesterday, today and forever. When I welcomed 2005, I was in the middle of what can only be described as a "dark night of the soul"--the lowest point thus far of my eight-year spiritual journey. What should have been a joyful and exciting time of my life (I was counting down the months until my wedding) was plagued with a frightening feeling of distance from God--numbness and avoidance mixed with despair anytime I came face to face with where I was spiritually. I was also battling time-management issues (some things never change) and hating my job--in fact, desperately wanting to call it quits--at Project Respect. And the wedding-planning was...well, let's just say it was going less than smoothly. On the bright side: I was, in fact, preparing to marry the man of my dreams. I was living at home with two wonderful parents and no bills to pay. I was sticking to my 2005 resolution to take control of my terrible eating habits and get in better shape. I was feeling more "at home" at a church than I had in years. I was enjoying a fabulous season of reconnecting with my best friend, sharing dinner with her every week, and I was also enjoying a fantastic Bible study with some of Steve's female family members. Yet the spiritual darkness persisted. Until God, as He always does, finally broke through. 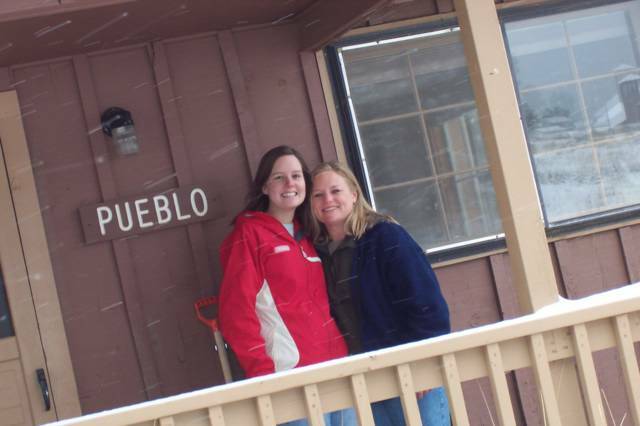 In March, plans for the unexpected blessing of a trip to Denver suddenly came together, and April found me out in Colorado, visiting dear friends. But the trip wasn't just about seeing friends; it was about meeting with God. My mentor Diane took me on a retreat in Estes Park--just the two of us--and it was there that the Holy Spirit began to pour water on the cracked, dry desert of my spirit. Soon after that, the whirlwind of major life changes began. Steve received a job offer and we visited Tennessee/Kentucky to check out the area and look for housing. He accepted the job and graduated from college. In the midst of all that, by the grace of God, I finished strong at Project Respect. Though I had many times wanted to quit, God gave me the strength to persevere, and in the end I was so grateful that I'd completed my job and walked away with some wonderful relationships through it. Of course, July was the big month. In the space of about two weeks, I got married, took a dream honeymoon in Maui, and moved to Tennessee, where Steve started his new job and I learned to take on a new role. (My cooking has come a LONG way in six months.) I also began to learn how God would use marriage as a tool to refine me. It's difficult sometimes, but it's definitely wonderful. In the fall, I found myself struggling with my role as homemaker and was challenged to be faithful in the small things. Steve and I were hugely blessed in finding a church to call home. God called me back to the basics, and Diane helped me get some perspective on this season of life. But it was easy to forget and I found I still had to preach to myself often. We were also blessed with visits from friends and family and trips home. All of this made the year fly by, despite the fact that I find myself in a much more slow-paced season of life than ever before. And that was my 2005. It has been a full and difficult and rewarding year. It has been a year of grace.